FileMS-1988 - Collington, Olive E., Victoria. FileMS-1989 - McKechnie, Robert Edward, 1906-. Vancouver; Surgeon. FileMS-1998 - Mount Baker Hotel. Oak Bay. FileMS-1999 - Findlay, Durham and Brodie. Victoria; Merchants. FileMS-2001 - Bell-Irving, Anne Hilda, d. 1977. Vancouver. FileMS-2002 - Victoria Horticultural Society. FileMS-2003 - Williams, David Ricardo, 1923-. FileMS-2005 - Moore, Charles, 1873-1965. Nelson; Civil and Mining Engineer. File MS-1999 - Findlay, Durham and Brodie. Victoria; Merchants. Findley, Durham and Brodie were commission agents in Victoria, B.C. G.T. Brown and Company, Practical Lithographers (G.T. Brown, W.T. 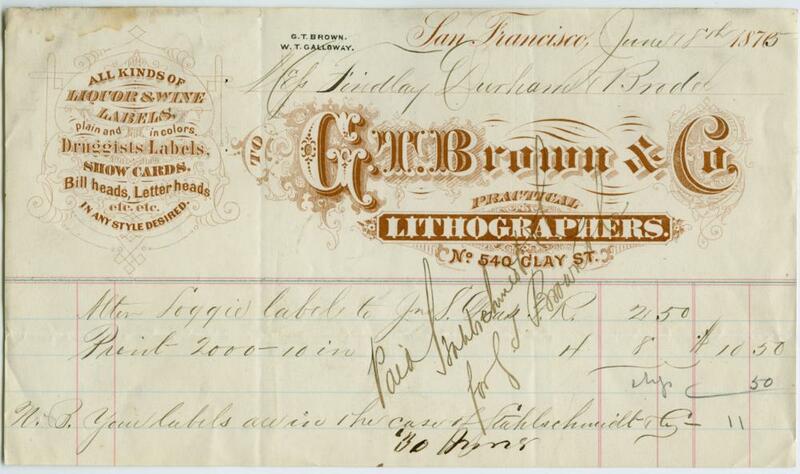 Galloway): invoice to Findlay, Durham and Brodie for 2000 labels altering the Loggie label to J.S. Deas.